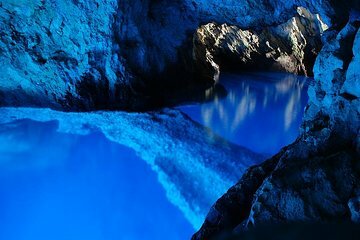 Scopri l'affascinante fenomeno naturale della Grotta azzurra in un'escursione di un'intera giornata da Spalato. Fai un giro in barca sulle calme acque del mare Adriatico verso la Grotta azzurra, una meraviglia costiera famosa per la luce color acquamarina che filtra al suo interno. Ammira la visualizzazione spettrale della luce solare e poi dirigiti verso l'affascinante cittadina di mare di Komiza per un tour panoramico, prima di visitare l'ipnotica Grotta verde, un luogo magico in cui la luce del sole filtra attraverso un buco fra le rocce frastagliate. Il tour si concluderà con un po' di relax e tempo libero nella pittoresca cittadina costiera di Hvar, prima del rientro a Spalato. This is a speed dating version of island tourism from Split. The beaches are beautiful and the staff is friendly and helpful. Best stops are those that avoid large concentrations of tourists. We also enjoyed the military caves. The Blue Cave was closed due to weather but the staff quickly adjusted with other island stops so it was great. This is not for boat novices as the first leg is a 1.5 hour boat ride and small boats are choppy and may be rough. Regardless, this was really good. The trip is one of the must things to do in Croatia: the caves are breathtaking, the water is amazing and if you're lucky like us you could see the dolphins!!! And skipper Ivan was great, he made the trip also better in and outside the boat. TOP! You get to see some incredible spots and being on the water is a lot of fun but you do not receive any information as you travel around the Adriatic Sea. We were also on a very uncomfortable boat and the tour was a bit disorganized in the beginning. You have some free time on Hvar island which was nice, but for some reason we did not stop at the swimming spot. Most the of your time is spent on the water. Overall this is a great way to see some incredible places but just be aware you won't get too much information if any at all and make quick stops at each spot. Simplemente increíble! La embarcación en la que viajamos era nueva y muy cómoda. Los lugares que visitamos son preciosos y estuvimos en cada uno el tiempo justo. Sin palabras para la cueva azul y la isla de Hvar. Los chicos que nos llevaron eran muy experimentados, y muy amables. The tour had good and disappointing aspects. The places we saw were absolutely stunning and we thoroughly enjoyed the blue cave and swimming about and exploring some islands. However, we were given pretty much no information all day by our guides, and instead felt the tour was merely just to drive us around on a boat. I had to google when we got back to our hotel to figure out where we had actually been wasn't 100 accurate to the itinerary provided. I understand there may have been a language barrier, that's fine, but we could have been provided with a schedule or information sheet instead. As I said, everything we did was great, but we didn't really learn anything about the area, history or culture which was disappointing.